In saucepan, heat 1/2 cup milk, water, and 2 tablespoons butter until very warm. Place milk mixture, salt, flour, yeast, sugar, and eggs in the pan of the bread machine in the order suggested by the manufacturer. Select the Dough cycle. Press Start. Once Dough cycle is complete, remove the dough from the bread machine and punch down. On a floured surface, roll into a large rectangle. Smear with the softened butter. Combine the cinnamon and 1/3 cup sugar. Sprinkle over the rectangle. Generously sprinkle the raisins and/or chopped nuts over the top. Preheat an oven to 375 degrees F (190 degrees C). Combine the confectioners' sugar, 1.5 tablespoons melted butter, vanilla extract, and 1.5 tablespoons milk into a thick frosting; set aside. Bake rolls in preheated oven until golden, 20 to 25 minutes. Remove and allow to cool 10 minutes. 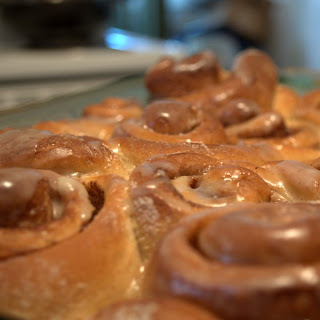 Spread frosting over baked rolls and enjoy.